you can still be physically active. Very large people face special challenges in trying to be active. You may not be able to bend or move in the same way that other people can. It may be hard to find clothes and equipment for exercising. You may feel self-conscious being physically active around other people. Facing these challenges is hardbut it can be done! The information in this booklet may help you start being more active and healthierno matter what your size! Warm up. Warm-ups get your body ready for action. Shrug your shoulders, tap your toes, swing your arms, or march in place. You should spend a few minutes warming up for any physical activityeven walking. Walk more slowly for the first few minutes. Cool down. Slow down little by little. If you have been walking fast, walk slowly or stretch for a few minutes to cool down. Cooling down may protect your heart, relax your muscles, and keep you from getting hurt. Set goals. Set short-term and long-term goals. A short-term goal may be to walk 5 minutes on at least 3 days for 1 week. It may not seem like a lot, but any activity is better than none. A long-term goal may be to walk 30 minutes on most days of the week by the end of 6 months. Get support. Get a family member or friend to be physically active with you. It may be more fun, and your buddy can cheer you on. Track progress. Keep a journal of your physical activity. You may not feel like you are making progress but when you look back at where you started, you may be pleasantly surprised! Have fun! Try different activities to find the ones you really enjoy..
Do I need to see my health care provider before I start being physically active? are a woman over age 50 or a man over age 40. Most very large people can do some or all of the physical activities in this booklet. You do not need special skills or a lot of equipment. Weight-bearing activities, like walking and golfing, which involve lifting or pushing your own body weight. Non-weight-bearing activities, like swimming and water workouts, which put less stress on your joints because you do not have to lift or push your own weight. If your feet or joints hurt when you stand, non-weight-bearing activities may be best for you. Lifestyle activities, like gardening, which do not have to be planned. Physical activity does not have to be hard or boring to be good for you. Anything that gets you moving aroundeven for only a few minutes a dayis a healthy start to getting more fit. The walking that you do during the day (like doing chores around the house or in the yard) can help you be more fit. But regular, steady walking that makes you breathe heavier can help you to be healthier. It will give your heart and lungsas well as your leg musclesa good workout. If you are not active now, start slowly. Try to walk 5 minutes a day for the first week. Walk 8 minutes the next week. Stay at 8minute walks until you feel comfortable. Then increase your walks to 11 minutes. Slowly lengthen each walk by 3 minutesor walk faster. Wear garments that prevent inner thigh chafing, such as tights or spandex shorts. See the list of additional resources at the end of this booklet for seated workout videos. Flexible. You can bend and move your body in water in ways you cannot on land. Refreshed. You can keep cooler in watereven when you are working hard. You do not need to know how to swim to work out in wateryou can do shallow-water or deep-water exercises without swimming. 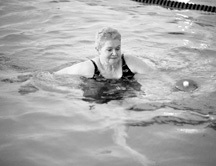 See the list of additional resources at the end of this booklet to learn more about water exercises. To learn more about weight training, see the list of additional resources at the end of this booklet. You can bicycle indoors on a stationary bike, or outdoors on a road bike. Biking does not stress any one part of the bodyyour weight is spread between your arms, back, and hips. To learn more about bicycling, see the list of additional resources at the end of this booklet. keep your muscles from getting tight after doing other physical activities. You do not have to set aside a special time or place to stretch. At home or at work, stand up, push your arms toward the ceiling, and stretch. Stretch slowly and only enough to feel tightnessnot until you feel pain. Hold the stretch, without bouncing, for about 30 seconds. Do not stretch cold muscles. Yoga and tai chi are types of stretching. They help you breathe deeply, relax, and get rid of stress. 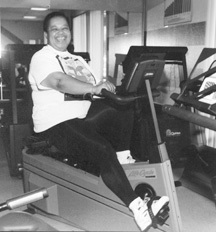 See the list of additional resources at the end of this booklet to learn more about these physical activities for large people. Put away the TV remote controlget up to change the channel. Try these tips for safe physical activity. Slow down if you feel out of breath. You should be able to talk during your activity, without gasping for breath. Never wear rubber or plastic suits. Plastic suits could hold the sweat on your skin and make your body overheat. Wear a knit hat to keep you warm when you are physically active outdoors in cold weather. Wear a tightly woven, wide-brimmed hat in hot weather to help keep you cool and protect you from the sun. Wear sunscreen when you are physically active outdoors. Walking . . . A Step in the Right Direction. NIH Publication No. 01-4155. 2001. This pamphlet explains how to start a walking program, presents a sample program, and shows stretches for warming up and cooling down. Available in English and Spanish from WIN, http://www.win.niddk.nih.gov. Steven N. Blair, Andrea L. Dunn, Bess H. Marcus, Ruth Ann Carpenter, and Peter Jaret, Human Kinetics, 2001. This book offers a step-by-step plan for getting and staying active. The information, suggested activities, and self-help tools in each chapter were successfully tested with people who followed the plan and learned to make activity a part of their daily lives. The 20 chapters correspond to the 20 weeks of the program, but readers are encouraged to go at their own pace. Available from http://www.humankinetics.com/, or your local or online bookstore. Pat Lyons and Debby Burgard. iUniverse, 2000. This book urges women to be physically active for fun, fitness, and positive body image instead of for weight loss. The authors describe a healthy lifestyle program including walking, swimming, dancing, martial arts, bicycling, and more. Available from http://www.iuniverse.com/ or your local or online bookstore. Steven Jonas and Linda Konner. Houghton Mifflin Co., Ltd., 1998. This book presents a plan for total fitness and healthy living no matter what your size. Chapters focus on accepting oneself, improving nutrition without dieting, managing stress, and doing moderate physical activity. Available from your local or online bookstore. Kelly Bliss. Infinity Publishing, 2002. This book provides motivation and information for healthy eating and plus-size fitness. It also teaches problem solving techniques. It offers information that can help the large person plan and achieve a fitness program that can be sustained for a lifetime. Available from KellyBliss.com, P.O. Box 572, Lansdowne, PA 19050; phone: 1-877-KellyBliss; Web: http://www.kellybliss.com/; or your local or online bookstore. Martha D. White. Human Kinetics, 1995. This book presents water exercises for fitness and muscle tone as well as exercises for injuries, postsurgical rehabilitation, and other special needs. Available from Human Kinetics, P.O. Box 5076, Champaign, IL 61825; phone: 1-800-747-4457; Web: http://www.humankinetics.com/; or your local or online bookstore. Alice Christensen, American Yoga Association. Fireside, 1999. This book presents a program of exercises, breathing, meditation, philosophy, and nutrition for older adults and those with physical limitations. Simple chair exercises and more challenging standing and floor exercises are described. Available from the American Yoga Association, P.O. Box 19986, Sarasota, FL 34276; phone: (941) 927-4977; Web: http://www.americanyogaassociation.org/; or your local or online bookstore. Real Fitness for Real Women: A Unique Workout Program for the Plus-Size Woman. Rochelle Rice. Warner Books, 2001. This book describes a 6-week introductory fitness program that includes warm-ups, aerobics, strength training and stretching techniques, and meditation. 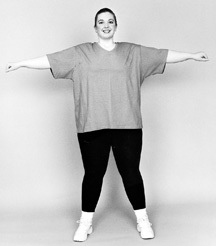 Photos of plus-sized women demonstrate the exercises. The book also addresses getting motivated, creating support, evaluating current abilities, and increasing self-acceptance. Available from http://www.rochellerice.com/ or your local or online bookstore. Ample Hygiene for Ample People. Judy Sullivan. Avon, 1997. This book describes resources that offer products or services for large people. It tells where to buy items like swimsuits, bicycle seats, and walking shoes. It also has information on exercise classes and sports instruction for large people throughout the United States, Britain, and Canada. Available from http://www.sizewise.com/ or your local bookstore. Yoga for Round Bodies, Volumes 1 and 2. Linda DeMarco and Genia Pauli Haddon. These videos offer a fitness system based on Kripalu yoga to promote strength, flexibility, stress relief, and cardiovascular health. Round-bodied instructors tailor classic yoga postures to large people at both beginner and intermediate levels in each video. Available from Plus Publications, Box 265-W, Scotland, CT 06264; phone: 1-800-436-9642; or http://www.amazon.com/. Jodi Stolove. This no-impact video series is designed to improve muscle tone, flexibility, and cardiovascular endurance without putting stress on your knees, back, hips, or feet. Available from Chair Dancing International, Inc., 2658 Del Mar Heights Road, Del Mar, CA 92014; phone: 1-800-551-4386; Web: http://www.chairdancing.com/. Dawn Fleetwood. This 50-minute instructional video features slow, gentle movements and breathing exercises that involve all of the muscles and organs in the body. Available from Orchid Leaf Productions, P.O. Box 72, Flint, MI 48501; phone: (810) 235-9864. BIG MOVES: Yoga for Chair and Bed. Mara Nesbitt. This video is designed for people who have difficulty getting down to or up from the floor. Led by a plus-sized instructor, it includes stretches done standing, sitting, and lying on a bed, plus a guided meditation. Available from Mirage Video Productions, P.O. Box 19141, Portland, OR 97280; Web: http://www.miragevideos.com/. The Young Men's Christian Association and Young Women's Christian Association offer physical fitness and health awareness programs in many locations throughout the United States. Contact YMCA of the U.S.A., 101 N. Wacker Dr., Chicago, IL 60606; phone: (312) 977-0031; Web: http://www.ymca.net/. Contact YWCA of the U.S.A., 1015 18th St., NW, Suite 1100, Washington, DC 20036; phone: 1-800-679-1209; Web: http://www.ywca.org/. This nonprofit organization seeks to improve health care and access to services for large people through educational programs, media monitoring, and medical conference attendance. Contact CSWD at: P.O. Box 305, Mount Marion, NY 12456; phone: (845) 679-1209; Web: http://www.cswd.org/. 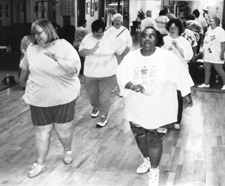 This nonprofit organization seeks to end discrimination based on body size and to improve the quality of life for large people. It offers a variety of publications and videos on size acceptance, self-esteem, and health and fitness. Contact NAAFA at: P.O. Box 188620, Sacramento, CA 95818; phone: (916) 558-6880; Web: http://www.naafa.org/. This site addresses issues ranging from self-esteem to fitness to finding respectful health care providers. It includes resources and links to related sites. Web: http://www.bodypositive.com/. 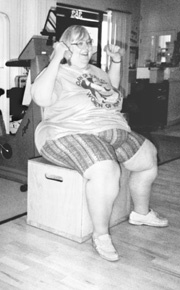 Big Folks Exercise and Fitness Resources Frequently Asked Questions (FAQ). This site provides information on where to buy clothing, videos, and books on physical activity and fitness for big people. It also lists organizations and classes worldwide for large people. Web: www.faqs.org/faqs/fat-acceptance-faq/fitness. This site includes information on walking, swimming, aerobics, stretching, and other fitness activities for large and very large people. A resource section includes fitness wear, books, exercise equipment, classes, and information on where to buy fitness videos for large people. There is an online workbook, eNewsletter, and a chat with plus-size personal fitness trainer Kelly Bliss. Web: http://www.kellybliss.com/.